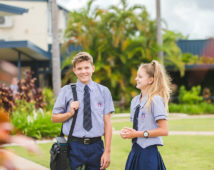 Welcome to Emmaus College, Rockhampton. 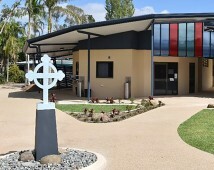 Emmaus College has, as its foundational story ‘The Journey to Emmaus’, a well-known story unique to the Gospel of Luke. The theme of ‘journey’ is one that is embraced by the College and is a fine metaphor. Our students will journey with many people throughout life and will meet Jesus in each other as they grow in spirituality, intellect, physical capabilities and wisdom. The journey of discovery, enlightenment, faith and commitment made by disciples on the road to Emmaus can be repeated in all of our lives. Our motto, ‘Light My Way’, also draws inspiration from this theme. Nurturing young people to continue Christ’s role as ‘light of the world’ and to appreciate the capacity of learning to enlighten are central to our work here at Emmaus College. 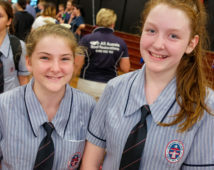 Emmaus College is a Catholic community of learners in which I implore all parents, students and staff to be active supporters. Nurturing and exemplifying this environment is paramount in securing a productive learning atmosphere where students are safe, interested, contributing, achieving and connected while finding meaning in their time with us. As a community of care we are all ‘magic weavers’ who make a difference in the lives of our young people through our interactions with them. We maintain this through a passion and understanding for our moral purpose; a positive attitude; and a value for diversity, mutual respect and equality. A student’s time at Emmaus will be an important part of their lives, and the College is structured to meet the needs of students at different stages of their life’s journey. 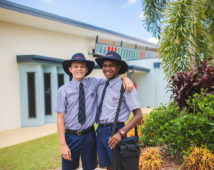 Our separate Middle School and Senior School campuses provide extensive facilities and create learning environments appropriate to the age groups they serve, giving students every opportunity to develop confidence, contribute generously, make friendships, learn new skills and experience success. Through our website I hope that you gain an insight into the many benefits on offer as part of the Emmaus community and I look forward to embarking on a wholesome and rewarding educational journey with your family. If you’d like to familiarise yourself with our College before enrolling, please don’t hesitate to make a time for us to show you around; we offer tours every Tuesday and Thursday at 3.30pm.